I know I shouldn’t have… While I needed to work on some more testknitting on the scalloped gloves, and while my grey top is just screaming for attention, I casted on a new project… but didn’t it turn out just as cute as a button? The Suri Merino from Blue Sky Alpacas, appealed so much to me that I just couldn’t resist! As soon as I saw and felt this yarn, my mouth started watering. 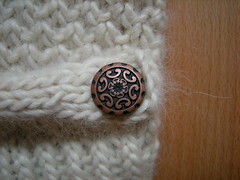 A moss stitch came to mind, and when I bumped into one of my long lost buttons when I was organizing my yarnroom, I just knew what to design. This is only the initial design. I need to make some changes untill I am a 100% satisfied. I just had to share. And now… back to testknitting the scalloped glove! 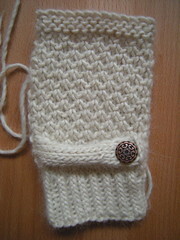 This entry was posted on Sunday, December 16th, 2007 at 1:13 pm and is filed under Knitting. You can follow any responses to this entry through the RSS 2.0 feed. Both comments and pings are currently closed. 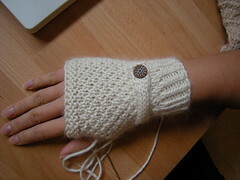 can i have the pattern for these?